I did my little owl last December so it has Christmas colors, green and red. Anyway, that's the beauty of clay art. We are free to create things with any color we like as long as it served the purpose. 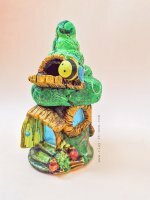 Let me show you how I created my owl clay figurine. Air dry clay. 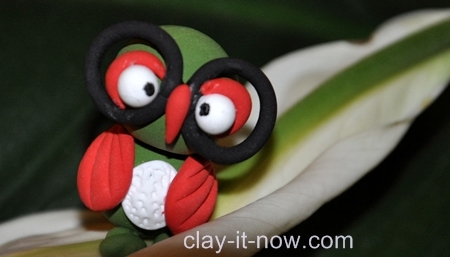 Check out my modeling clay recipe if you want to make your own clay. Black marker to draw the eye balls. 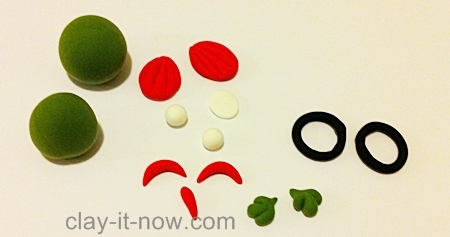 Make two ball clay shapes for head and body in any color you like. Make sure the head is bigger than the body. Roll two small teardrop clay shape, same color with the body and head. Flatten this and make two lines in front representing the claws. The owl must have a prominent eye feature. So I make two black rings from pipe shape to emphasis the eyes. Next, roll a small teardrop shape in white color, flatten it and make some holes with toothpick. It will be pasted on to the body of the bird. Then, take different color of clay for the wings, eyelids and nose. Roll two teardrop clay shape for the wings. Flatten it and make some lines. Also, roll two small sausages for eye lids and one small teardrop shape for the nose. Lastly, make two white ball clay shape for the eyes. Start assemble all the components. You may begin by attaching the head to the body with white glue. Attached the claws, the eye balls and the eye's rings. Continue with the eye lids, nose and wings. To make the bird prettier, you can add small white dots to the body as the fur. And, that's it! You are done with your work. It's easy, isn't it? I did this in less than 15 minutes. If you make a miniature version, you can add jewelry pin and wear it as earrings, pendant or hand phone accessories. It's funky! So, did you make this following our tutorial? Or, did you make other clay crafts that you have not seen it here? Please upload your pictures and story using the submission form at this page. Alternatively, you might want share it at our Facebook page. Have fun everyone and look forward to your pictures.